If you are searching for a small compact wireless charger you might be interested in the new chargeONE created by STARQ and designed by Marvin Bruckmann. Watch the demonstration video below to learn more about the powerful wireless charger which is now available to back via Kickstarter with pledges available from $35 for early bird backers and shipping expected to take place during March 2018 if all goes well with the crowdfunding campaign. The chargeONE is capable of offering fast charging thanks to its 10W wireless charging technology and is capable of charging compatible Qi Android and iOS devices. 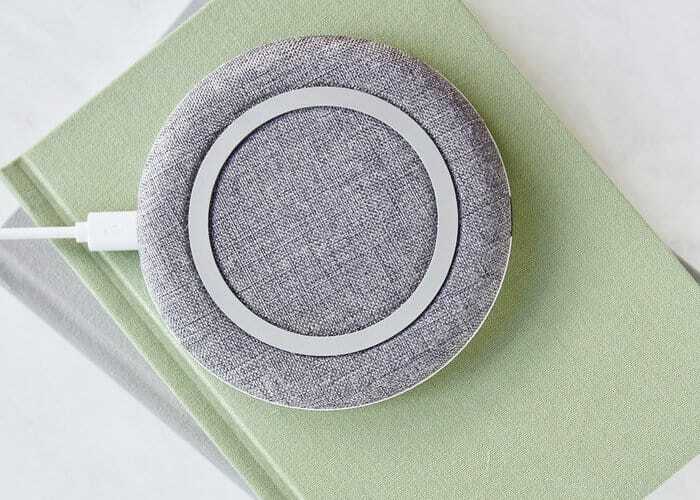 Underneath the wireless charger is equipped with rubberised anti-slip rings to help keep both the charger and phone in place all enclosed in a woven fabric design with no visible logo allowing it to blend into the aesthetics of your home or office. For full specifications of the chargeONE wireless charger jump over to the official crowdfunding campaign page by following the link below.